333- How to Deliver Criticism and Survive! Learning how to deliver criticism in a constructive and encouraging way is always a difficult task, especially if you are not someone who enjoys conflict! Learning How to Deliver Criticism can Make or Break You! However, if you are to be a leader in worship, you need to deliver criticism at times, so it is worthwhile discovering the best and least explosive way of doing this. How many of you have discovered that musicians and singers are very sensitive to even minor points of correction or criticism? Yes, we are all often very sensitive to this, and this means that learning how to deliver criticism in the right way become an extremely important aspect of leadership within a worship team. Get this wrong and you create a whirlwind of rebellion and tension within the worship team. Get this right, and you can actually create an ally within the team, and also build encouragement and healthy relationships between team members. So it makes sense to learn how to deliver criticism in a way that builds your team and relationships rather than destroys them! The guys share their own experiences, both being the leader and delivering the critique and also being the one criticised, so you will get a good look at both sided of the coin in this exciting podcast. They also discuss their preferred method of sharing criticism, a method that St Paul used and which is so powerful, the recipient actually walks away encouraged and build up rather than discouraged or even destroyed by the time you spend together. 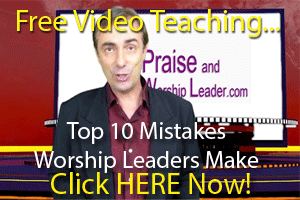 Trust me worship leaders, this information is gold to those who want to lead a happy and successful worship team!